Dehydrating Apples for Apple Pies and Tarts! By dehydrating apples at home, you can have a steady supply of juicy apples available all year if you're not lucky enough to have your own apple orchard out back! How? Dehydrate them when they're on sale (and in season)! Simply follow the instructions below – and purchase apples when they are in season and plentiful via the grocery store in bags or from your own back yard in bushels! Apple's best vitamins are: vitamin A, vitamin C, followed by vitamin K with trace amounts of Choline, Pantothenic Acid, and Niacin. The mineral content of apples are Potassium, followed by Phosphorus, Calcium, Magnesium, and trace amounts of Zinc. Apples also contain Omega-3 and Omega-6 fatty acids. Tip: When apples are out of season, consider using frozen apples instead. As noted in the instructions below, you won't have the peel the apples, plus you don't need to use apple juice to spray the apples in step 2 ... Now just how easy is that? If using frozen apples, ignore steps 1 and 2. Peel, core, and slice your apples by hand or with a handy apple-peeler-corer gadget. Place slices in a bowl and generously spray with lemon juice. TIP: Use a pump-top from a new unused spray bottle, pick one that fits your lemon juice bottle, look for one that has a long enough plastic tube that will reach to the bottom of your lemon juice bottle. Arrange the apple slices on your dehydrator trays, making sure the apples don't overlap. (or per your food dehydrator's instructions). Delicious dried apples are pliable when dried. Drying time: between 4-10 hours. Please remember to rotate your dehydrator trays for even drying. 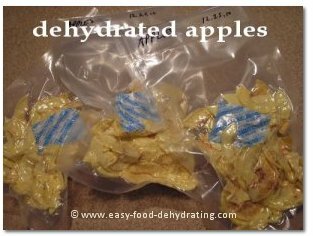 Simply add water to your dried apples to re-hydrate them, (read more about re-hydrating food HERE) and we're off making the best apple pies around ... or applesauce, or apple breads, or cookies. Hmmm :-) Soon the delicious apple-pie aroma from your kitchen will be drawing friends and neighbors for miles! You'll want one of those apple peeler corer gadgets shown below – Honest! Not only are they easy to use, they are truly fascinating to watch. Take the grunt work out of spud peeling – yes, you can peel potatoes with them too! The above image and/or link are Amazon ads, and as such, should you purchase an item by clicking on it, a cookie may be placed on your computer and Easy Food Dehydrating may receive a small commission from your purchase.